[An English translation of this document is found online on the website of Vicente M. Martínez of Taos who died in late February of this year 2016. He was a close relative of the Cura de Taos who lived in and owned the Padre’s house in Taos. In later years, Vicente resided in Florida and more recently in the state of Washington with his son Dr. Antonio José “junior” named for his illustrious ancestor. On the tenth anniversary of Mexican Independence from Spain, Padre Antonio José Martínez of Taos wrote and presented Exposición, a treatise on the Territorial government of New Mexico dated November 11, 1831. In his presentation made to his fellow delegates of New Mexico, Padre Martínez attempted to clarify the meaning of their representative body called La Diputación, the legal body of elected “deputies” or representatives of New Mexico under the government of the Republic of Mexico that lasted from Mexican Independence from Spain in 1821 until the occupation of New Mexico by the United States in 1846. In his treatise, Padre Martínez also advocated that the limited powers of the Diputación be broadened. After its members received, read, and ratified the Exposición, they sent it for enactment to the representative of the federal government in Mexico City. David Weber (1940-2110), first-rate scholar of things and people New Mexican, authored a classic Padre Martinez-related work in 1996–On the Edge of the Empire: The Taos Hacienda of Los Martínez. While teaching at San Diego State University in 1975, Weber wrote his commentary on the 1831 Exposición by Padre Martínez for the journal of El Colegio De Mexico, and it was published as El Gobierno Territorial de Nuevo México: La Exposición del Padre Martínez de 1831. The actual Spanish text for the Padre Martinez document Exposición de 1831 is from the H.H. Bancroft Library at U.C. Berkeley. It is rerpinted in the second part a fourteen-page article by David J. Weber published in Spanish by El Colegio de México, “El govierno territorial de Nuevo México: La Exposición del Padre Martínez de 1831” in the journal Historia Mexicana Vol. 25, No. 2 (Oct.-Dec., 1975), pp. 302 to 310. The first eight pages are a commentary by Weber, and a facsimile of the original Padre Martínez text follows. One may read the article for free, or download and purchase it for $19. Access JSTOR through one’s educational institution OR join <REGISTER & READ beata Program> online for free. An indiidual scholar or researcher may register at the following link: <https://www.jstor.org/action/showLogin?redirectUri=%2F>. Write in and SELECT “El govierno territorial de Nuevo México: La Exposición del Padre Matnez de 1831”. To read the full text, add the article to your “reading shelf”. David Weber, familiar with my English version of the Santiago Valdez 1877 Biografía del Presbítero Antonio José Martínez, Cura de Taos, encouraged me to publish it–something yet to be done. With this blog item, I present my English adaptation of Weber’s commentary on the Padre’s Exposición, but without accompanying footnotes that may be found in the Spanish online version cited above. The accompanying blog item is my English translation of the Padre Martínez Exposición de 1831. In October of 1830, the District of Taos elected their parish priest and “home boy” Padre Antonio José Martínez to serve for two years as a member of the Diputación de Nuevo México, the local legislative delegation of seven representatives. The New Mexican territorial legislature of the republic of Mexico was convoked about a month later, and on November 7, 1830, Martínez traveled south sixty miles or so toward Santa Fe where the sessions were about to begin. After about a year of service in the Diputación, the Cura de Taos became convinced that the most urgent problems of New Mexico would not be resolved unless the Diputación would come to have greater authority. Padre Martínez left some writings about this matter in an essay or treatise entitled Exposición dated November 11, 1831. He addressed it to José Antonio Chavez, Governor of New Mexico who at the time was also President of the Diputación. Martínez held that the Diputación was so weak that it would end up dissolving on its own. He wrote that the Diputación was in practice charged with only three functions: supervising primary schools, granting land, and maintaining relations with the Supreme Congress in Mexico City through the Deputy (representative of the Diputacion) of New Mexico. Martínez held that the Diputación was lacking sufficient power to effectively be in charge of the three areas, and that they would be better managed by various local town governments (ayuntamientos) together with a political chief of a territory, a mayor or an equivalent. Of greater importance, moreover, Padre Martínez argued that the Diputación lacked the power to resolve the more urgent problems of the territory: juridical inefficiency, necessary church reform, and military defense in the face of depredations of New Mexicans by so-called uncivilized Indians. The priest was also bothered because members of the Diputación did not receive any salary. The seven Deputies had attended the sessions at their own expense, and without attending much to their own business affairs. Martínez insinuated that unless the Diputación became an important body with real power to obtain significant reforms, it would not be worth wasting the necessary time and money to continue its activities. Padre Martínez gave his presentation (Exposición) before the territorial Diputación on November 11, 1831. The Deputies, the other six elected representatives of New Mexico, voted in favor of his presentation, and decided that the document be sent to the Congress in Mexico City. The next day, the Diputación addressed a letter to Anastacio Bustamonte, Vice President of the national Mexican legislative body, but who wasat the time functioning as its President. The Deputies asked him to present the Exposición of Padre Martínez to the Mexican Congress in the hope that the governing body “would wisely take more energetic steps …to remedy the positively difficult wrongs that…afflict this forsaken land” of New Mexico. The Diputación sent the presentation (Exposición) of Padre Martínez together with the Padre’s cover letter to Mexico City where it arrived, but did not result in any political reform for New Mexico. Historians are aware that Martínez wrote a cover letter, but none have ever seen it. However, the Exposición de 1831 has been preserved at the Archivo General de La Nación (Mexico), and U.C. Berkeley has copy of the text in its own archives. 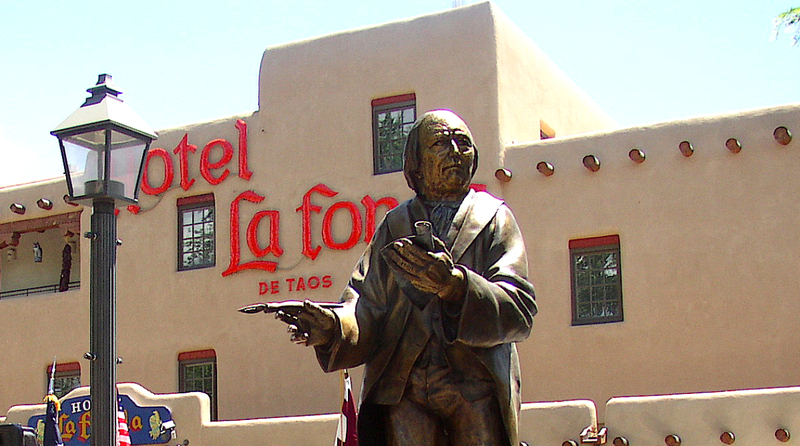 The Exposición de Padre Martínez is worth becoming better known for its early expression of the viewpoint of one of the most important and controversial historical figures of New Mexico. Antonio José Martínez from a well-to-do family was born in Abiquiú, New Mexico in 1793. He studied at the seminary of Durango where he was ordained a priest in February 1822, a year after Mexico’s independence from Spain. He was one of the few native New Mexicans who was ordained to the diocesan priesthood in a Province in which the majority of clergy belonged to the Franciscan order. A few years after returning to New Mexico after his seminary studies, Martínez in 1826 became the parish priest in charge of Taos and its environs. However, he did not technically become pastor until several years later. Taos was his boyhood home where he had moved with his family in 1804 when he was eleven, and where he remained until his death in 1867. A man of great energy, and one of the few sophisticated persons of that remote and sparsely populated province, Padre Martínez became a dominant figure of the political, religious, and cultural life of New Mexico. He founded educational institutions on the primary level–a school for girls as well as boys–and a preparatory seminary helping other New Mexicans prepare for the priesthood, and after the American occupation opened a law school. From 1835 until the War of 1847, he operated the only printing press of the territory, and occasionally lent it to officials of the government. As a dedicated nationalist and admirer of Padre Hidalgo, Padre Martínez fought to obtain political and ecclesiastical reform in his own jurisdiction. He also called attention to the growing influence of Anglo Americans, and helped many integrate into the life and culture of New Mexico. Padre Martínez continued his interest in politics, especially as it might be helpful in improving the lot of his fellow New Mexicans. Although his 1831 essay decried the weakness of the Diputación, Martínez served in subsequent legislatures. The political status of New Mexico, under the Constitution of 1836, changed from a territory of the Republic of Mexico to a “Departmento“–analogous to a state in the Republic. By1837, Padre Martínez was elected to the Junta Departamental, at the time called La Legislatura. He was elected to that same position again in 1845, but the post was now called the Asamblea Departamental. Either within or outside of the Provincial Departmental Assembly, Padre Martínez was involved in many political battles. For example, in 1837, he tried to pacify popular uprisings against the new taxes that arose in Taos and in Chimayó, and that had been imposed by the Departmental system introduced by Governor Albino Perez. He wrote his own autobiography at this time, and the following year of 1838 published it on his printing press as Relación de Los Méritos del Presbítero Antonio José Martínez, Cura de Taos. During the last decade of his life, Padre Martínez found himself involved in a complex struggle with native Frenchman Jean Baptiste Lamy who served as the first bishop of New Mexico after it became a political entity under the American flag. The priest’s public opposition to his bishop’s reinstatement of tithing as church policy became the tipping point of the conflict that led to the Padre’s ecclesiastical censures. Through suspension in 1856, Bishop Lamy deprived Padre Martínez of his license (faculties) to function as a priest. Two years later and nine years before his death, Bishop Lamy officially excommunicated Padre Martínez in 1858. However, in order to serve family members and parishioners loyal to him but inadequately served in the new ecclesiastical regime, the Padre continued to minister from his own private chapel and from other similar chapels in the vicinity. The Exposición de 1831 offers a window into the insights of Padre Martínez’ political thinking. It sheds important light on the situation of New Mexico and indirectly also upon its whole northern borderlands. In the document, Padre Martínez publicly laments the weakness and limits of the Diputación of New Mexico, and adamantly contrasts those limits with the power of the legislatures of states in the young Mexican republic. The Diputación was, in a sense, a precursor to the state legislature. The Diputaciones in Spain were established as centers of resistance against Napoleonic invasion of 1808, and they remained formalized by the liberal Spanish courts that authorized their establishment in the New World. In Mexico, the Diputación rapidly evolved to become a vital force within regional politics, promoting the fall of the Iturbe regime, and playing an important role in the tumultuous business affairs conducted with the adoption of the federal constitution of 1824. Under that constitution, the Diputaciones matured to become transformed into relatively autonomous state legislatures whose responsibilities remained expressed in the respective state constitutions. These legislatures generally had more power and greater autonomy than the Diputaciones. They were also much larger bodies whose members generally were supposed to receive a salary during the time they were in session. Meanwhile the rest of Mexico was experimenting with representative government on the state level, but the situation of the territories was different. New Mexico was one of five territories created in 1824, together with Alta California, Baja California, Colima and Tlaxala. Under the 1824 Constitution, the Mexican Congress expedited laws for the internal administration of its territories. Nevertheless, the weight of other more urgent matters did not allow the Congress to act. Under the Constitution of 1824, the territories remained in a kind of political limbo in spite of the protests of functionaries on all levels. Without approval or guidance from Mexico’s national Congress, the Diputación of New Mexico established in 1822 continued to function without authorization under the Constitution of 1824. Lacking in any current legislation regarding its responsibilities, the Diputación of NM continued its procedures established by the Spanish Constitution of 1812 (Title VI, Chapter II) and by a Spanish decree of June 23, 1823. Spanish law granted it powers to supervise the collection of taxes and expenditures of funds of its province in order to promote public health and public education, to foster agriculture, industry, and commerce, and to ensure the welfare of the missions, monitor the abuses of the clergy, and finally to take up the census and collect statistics. These powers were apparently ample, but were limited by other regulations that permitted the Diputación to be nothing much more than a consultative body. Both the Constitution of 1812 and the Decree of June 23, 1823 made it very clear that the Governor exercised ultimate authority. All communication between the Diputación and the central government had to be channeled through the governor in the same way as any other communication with municipal governments. The Governor was the only one who could promulgate laws and decrees in the province. Moreover, it was required that the Diputación consult the central government and wait for its approval in order to be able to act on important questions. Even routine plans to promote agriculture, industry, commerce or the arts—for example—had to be sent to the government for approval. In this way, the federalist dream of autonomy and local government that would respond to local conditions was a failure for the territory of New Mexico. In the preamble for the Constitution of 1824, a committee headed by Lorenzo de Zavala had been enlarged in favor of a strong regional government, bringing together questions such as “what relationships of convenience and uniformity can there be between the warm earth of Veracruz and the frigid mountains of New Mexico?” The question was never answered in any satisfactory way. New Mexico, left with an antiquated territorial government with little room for local initiative, was isolated with two separate issues of defense: one against autonomous Indian tribes who are mounted and well armed, and the other against Anglo-Americans who are advancing toward the west. Texas completely lost its Deputación upon being merged with Coahuila in 1824. In one of the first sessions, on August 28, 1824 in Saltillo, the legislature of Coahuila and Texas abolished the Diputación of Texas. Moreover, the delegate for Texas did not come to express his opinion on this question, and the decision was not well received in San Antonio. Nevertheless, the resistance seemed futile. In the Departamento de Texas, therefore, the only bodies of elected officials that existed between 1824 and 1836 were on the municipal level. In 1832 the city government of San Antonio deplored the failure of the [Mexican] Congress to establish in Texas a government that understood local conditions, and blamed this failure on the “paralyzing” of Texas. In this way, under the Constitution of 1824, the furthest provinces of the northern frontier–Alta California and Texas, in the same way as New Mexico–were able to count themselves among the weakest links of the federalist system. At the same time, there did not exist other provinces in the nation that were more exposed to the danger of being absorbed or conquered by the United States or by another outside power. As the men of the frontier used to know so well, the political weakness of the provinces used to contribute to its vulnerability. El Crepúculo de la Libertad, a short-lived newspaper founded by Padre Martínez and published in Santa Fe at the end of 1834, expressed its opinion on the ultimate consequence of the [Mexican] federal abandonment of New Mexican territory and of the rest of the northern borderlands. In one of its editorials, El Crepúculo asked, “What other consequences ought this deplorable abandonment bring to the nation?” The answer: “The loss of New Mexico and its dismemberment from Mexican territory.” El Crepúsculo, mistakenly, began to predict that the United States would not use force to conquer New Mexico. “No,” it editorialized, ” the [18th] century ended, and cast to the ground this manner of subjugating peoples: the empire of brutal force has been substituted by the strength of the conviction of reason….” If the United States were to conquer New Mexico, it would be with “its industry, its ideas of liberty and independence, and the stars of the capitol of the north would undoubtedly shine brighter in New Mexico insofar as its darkness is thicker because of the deplorable state in which the politics of the Mexican cabinet holds it.” El Crepúsculo could not have been more mistaken about announcing that brutal force had ceased being in vogue. However, its prediction concerning the failure of the (U.S.) federal government in attending to the necessities of the borderland could not have been more on target, and would have to lead to the “dismembering of Mexican territory”.